Dan Amira makes a point today about President Obama’s new tax proposal, and I’m trying to figure out if I think it’s mostly a pedantic complaint or one with real substance. You be the judge. describes his own plan that way. But it’s not true. So the question is: what’s the best way to describe this? The Obama way (“keep the tax cuts for anyone making less than $250,000”) is more populist and a lot easier to understand. The technically correct way is more complicated, but it reduces the alleged class warfare angle a bit. 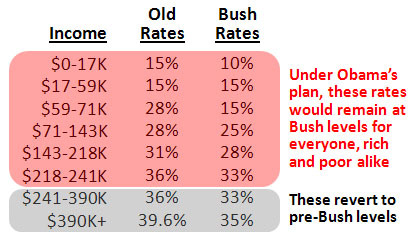 Obama isn’t taking away all the tax cuts the rich got from Bush, just some of them. So which is better? More populist or more centrist-y? Decisions, decisions…..